There isn't an official press release yet, but apparently shoppers (and myself on 11/26) have stumbled across a new line up of Kemps frozen yogurt (because two lines wasn't enough, they needed a third). So first there is your typical Kemps frozen yogurt with regular and fat free flavors. They are packaged in regular looking ice cream containers. Then last year they debuted "frozen yogurt shop" in fancy clear containers, something akin to clear gelato containers you see some companies use. Now we've got a new line up of pint sized froyo in six flavors to start. Yet again the containers are clear so you can see what is inside. 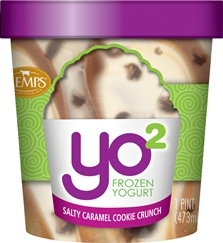 Salty Caramel Cookie Crunch: Vanilla frozen yogurt with shortbread cookies, chocolaty chunks and salty caramel swirl. There isn't an official press release yet so I don't know officially how these are different. I do notice that there are no added live yogurt cultures but they still use "cultured skim milk". The ingredient lists also seem to be simpler than their usual froyo so that is probably part of this new line up as well. You would think this would be prominent in the packaging though the heavy use of green might imply a more natural product. Allergy note: they are using peanut oil in their fudge swirls (could be moose tracks fudge).